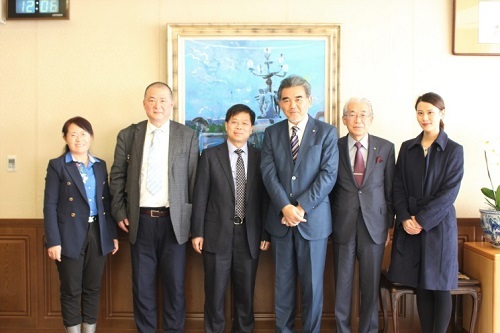 On November 20th 2018, President WEI Chenglong of Changsha University and other members visited Higashi-Hiroshima Campus of Hiroshima University and met with President Mitsuo Ochi. The meeting was attended also by Executive and Vice President Toshiyuki Sato (International/Peace/Fund). HU concluded an inter-university exchange agreement with Changsha University in March 2017 and both universities have promoted student exchanges mainly through the HU’s “Morito Higher Education Institute 3+1 Program”. It is hoped that academic exchange between both universities will be further promoted.